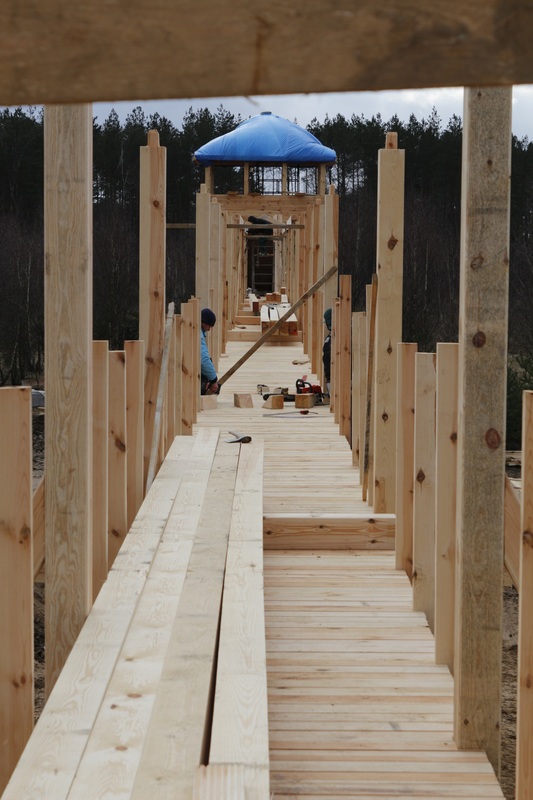 We joyfully announce that building of the footbridge and observation tower in the “Securing the population of European bison in the north and western Poland from tourist pressure” is coming to an end and soon its final effect will be available for You to see. You are welcome! 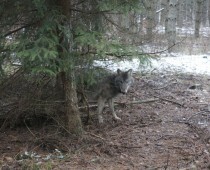 Another wolf released from a snare! Such stories are daily bread to us and again we managed to be in the righ tplace in the right time. The second time we saved wolf caught in a snare. 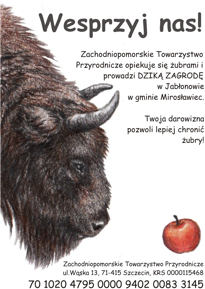 The information about the wolf we received on sunday morning from hunters associated in Lynx Dobiegniew Hunting Club. 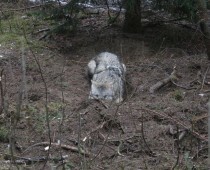 The hunters during searching hunting area encountered the trapped wolf near Chrapow spot. After the arriving at the place it turned out that that was big, about 8 years old, experienced wolf, probably the alpha male, that is a leader of a pack. The wolf was caught in steel loop tightened around its pelvis and slightly immersed in skin. The animal was very weakened and that meant that it had been there for about four days. Luckily, the wolf did not have bleeding wounds, so we decided to intervene as little as possible and immediately relase him. We installed telemetery collar on him to monitor his trails. On the area of this incident there is a weak GSM signal, so we may wait for first telemetry data received for a week or two. Anyway, any data received would mean that the wolf is alive and this is the most important information to us now. We would like to send thousand thanks to hunters who passed the information about the wolf to us. Thanks to them we carried out successful operation and the wolf is probably alive. At their request the wolf has been given the name “Rysiu”, taken from the name of the hunting club. 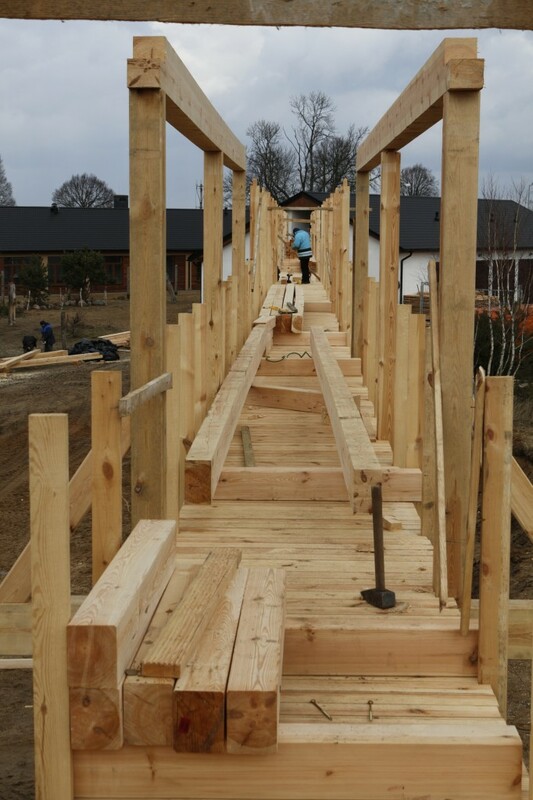 Therefore, keep our fingers crossed for the wolf called “Rysiu”. If you know about similar situations, please inform us. The fate of wild animals is in our hands. Let’s protect them from cruelty of poachers. 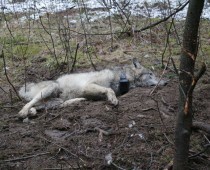 The wolf after installing telemetry collar and releasing from a snare. The mother of Bysia called “Single-horn” was already an aged cow with enormous experience when she gave birth to the title-cow. In late autumn when Bysia was already quite big half-year cow, Single-horn started being ill. The calf stayed close to her all the time. Unfortunately, Single-horn died in January. 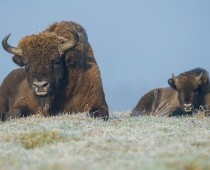 Bewildered Bysia had been returning to the dead mother for several days until she started going away in search for other bisons. 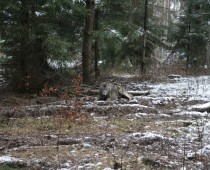 At that time a local herd was already in a place of winter feeding, which was not known by Bysia. Destiny of orphaned calves is insecure and on areas with wolf occurence a lone calf is an easy prey. 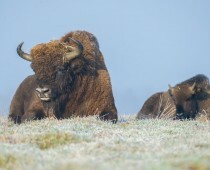 She was saved by Western wind , which brought smell of a small group of bulls feeding on fields at Długie Lake. It turned out that there was her father called The First in the encountered group. Bysia luckily found company and protection. 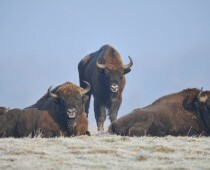 Today, her security is provided by three wonderful bulls, see it for yourself. Lucky Chap makes out well! 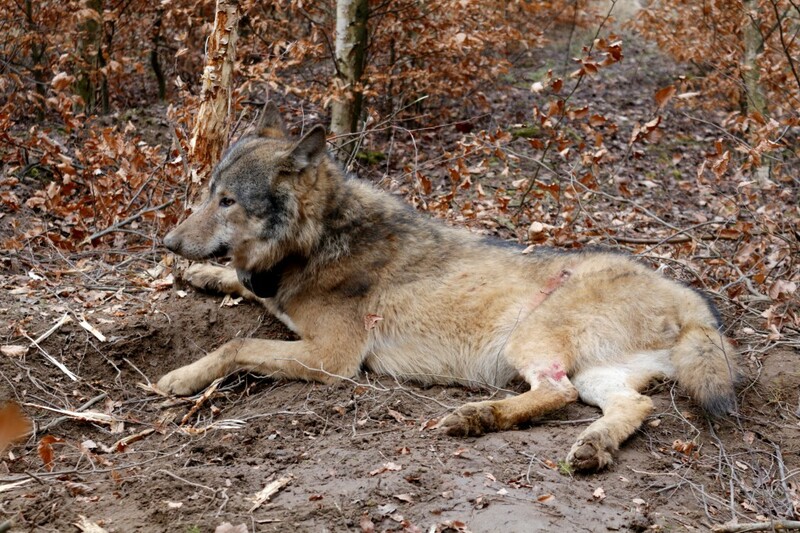 Last week we freed a wolf from a snare. We were afraid whether an animal exhausted in a trap would make out in the wild. 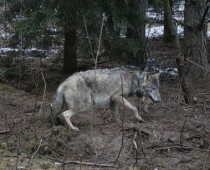 Telemetry collar sent first data just on Monday – it showed that the wolf reposed for two days at the Kielpino Lake and the he went to a military training field. In first days he moved at a rate of several hundreds meters a day, yet with the time passing distances traversed were getting longer. 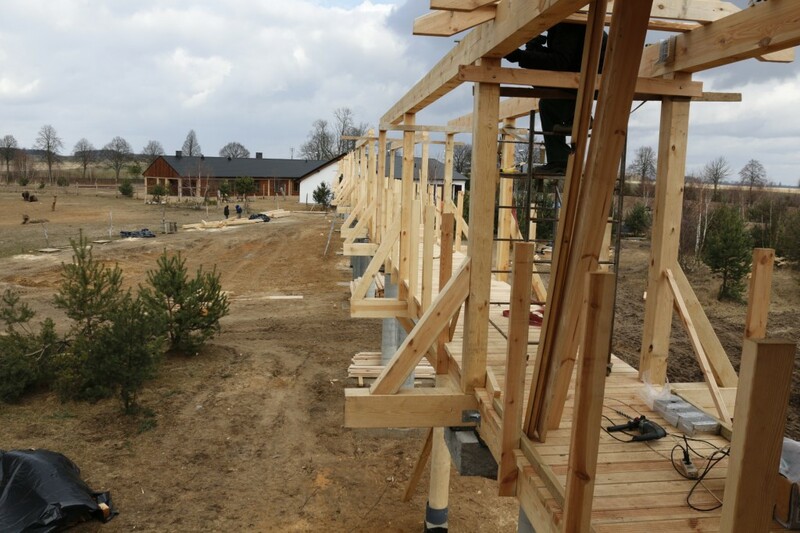 Yesterday, the wolf walked through whole area of the Drawsko Forest Inspectorate and today it is already around Swieciechowo spot in Drawno municipality. We know that it is staying with a pack. The wolf has gone through the most difficult period after its release and probably the most difficult period in its life. Telemetry collar installed on it should work and transmit data for about a year. We are eagerly looking forward to next data packages from the wolf. On last Sunday we got anonymous information about a wolf trapped in a snare. Sadly, animals are still exposed to threat from poachers. Thanks to sensibility of an informer we found the wolf and released from a loop which was tightened around its underbelly. 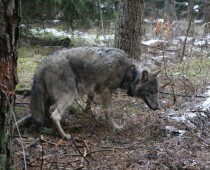 After cutting a line we installed telemetry collar on it so as to monitor our young wolf.